As smartphones are tablets are becoming the oxygen of every gadget user, and recent exponential growth in number of users on multiple smart platforms like Windows, Android, iOS & HTML5 has created the need of developing app for every possible business, service or website. 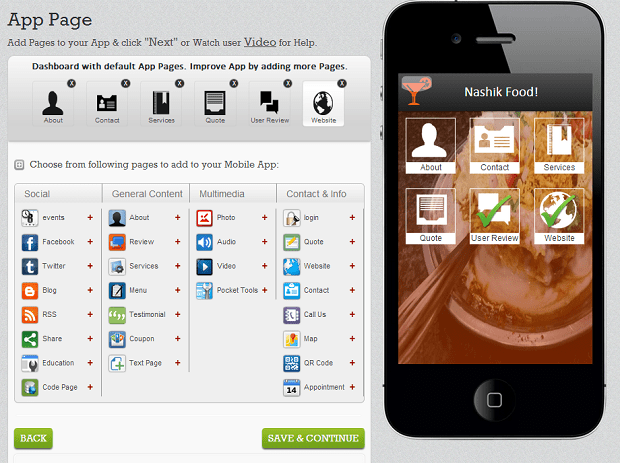 But it’s not possible for all businesses to get a custom developed app due to time and money constraints. Understanding such need from various market has created one of the great Online UI based software for app development called – Appy Pie. As I mentioned earlier this online tool has a drag and drop easy-to-operate user interface, that any novice can understand and use. As you can see below, within hardly 5 mins my app for local food is almost ready. It’s that simple! You can add social accounts, blogs, RSS feeds if you are already creating content online, videos, photos and so much more to enrich your app. If you are a doctor, dentist, salon owner or any other professional who needs to set up appointment through apps, it is also possible using Appy Pie. Feature rich pocket tools will give you access to advanced functions like – GPS Location Tracker, Camera, Mortgage Calculator & more. Being a powerful HTML5 based environment, all apps created with Appy Pie are already compatible with all major platforms like iOS, Android, Windows Phone & Blackberry. You can monetize your apps, send real-time updates to users, send push notifications, user QR codes and every other new-age feature for all platforms are already available with an Appy Pie account. If you are even a little bit skeptical about the whole process, just head over to their website and start building your app right away for FREE. Once you are satisfied with what you have made then and then only you can upgrade to paid account to publish your app any platform within minutes. Overall, this app is an outstanding way to make your business smarter by making your app available to customers and enhance your business even further. The pricing is very affordable for any small business and keep the development thing clutter free. I will highly recommend this app for all small to medium businesses, individuals and those who would want to give their app a personal touch!